Over the past fifty years, commercialization of space has been a goal of mankind. Ever since Sputnik and Mercury, it is generally agreed that the human race will eventually reach the stars. It is only a matter of when. The 20th century revolution in physics which brought a deeper understanding of gravity, inertia, and electromagnetism still awaits the inventive genius, though government documents reveal classified developments that far exceed scientific expectations. While acknowledging that taxpayer dollars have already created propulsion breakthroughs, some Congressional efforts advocate declassification and disclosure for civilian use. A one-hour video lecture by Dr. Valone from the Breakthrough Energy Movement conference in 2013 is on YouTube discussing all of this in more detail. In parallel, future propulsion innovations are being developed by our ever-expanding COFE colleagues and interested graduate students worldwide. Of course we are also very practical about the dangers of space travel. At the top of the list is space radiation which we are hoping to see inertial shielding offer a protective region of low inertial mass region inside the ship once it is developed. For more information about this viable emerging science of control of inertia, view the ten minute testimony Dr. Valone gave at the National Press Club in 2013 on YouTube. One can also visit our IRI Media "Watch the Videos" page to also see the two-part "Researching the Energy and Propulsion of UFOs" lecture video. The complete slides for that lecture should be brought up next to the video to see what Dr. Valone is talking about. Click on Exopolitics and X-Conference Valone Slideshow on UFO Energy and Propulsion. Also included below is an educational graphic from Space.com covering the details about radiation during space travel to Mars. Electrogravitics and Electrokinetics for Aviation and Space Travel by Dr. Thomas Valone, is an excerpt from Chapter 1 of the new book, Electrogravitics II, published by Integrity Research Institute (pdf). Billion-Dollar Trial & Error of the aeronautics industry, demonstrating the failures of all conventional propulsion developments to date for near space orbit and back. The situation demands a more advanced technology. Electrogravitics Development Invention by T. Townsend Brown, reaching a peak of aerospace interest in the 1950's. NASA is just starting to catch up with their first patent. The Hartman Project Demonstration of inhomogeneous magnetic field gradient force for fuelless transportation. Magnetic Energy Converter Report available on the Godin and Roshchin project to replicate John Searl's work (AIAA 2001-3660), whose invention combines homopolar and electrogravitic technology. Detailed business plan is available from EPS, LLC. Plasma Focus Fusion and patent preparation for Eric Lerner whose invention has achieved a billion degrees, satisfying their NASA nuclear propulsion grant criteria. See Business Plan for more details about energy applications. AIAA Joint Propulsion Conference Particularly the Breakthrough Propulsion Physics Section. The 2001 AIAA JPC was progressive and future-focused. Space Drive Conference Weinfelden, Switzerland annual event with innovative presentations. Matter-Antimatter Research Particularly work by Bernard Haisch that centers on "Prospects for an Interstellar Mission" and the calculated amount of antimatter needed for a round trip. Zero-Point Energy Truly the "fuel of the future" and the subject of a popular book by Thomas Valone. "Feasibility Study of ZPE Extraction" study available now from IRI (online version is free for a limited time). Bulgarian Circular Craft video clip Truly the "propulsion of the future" and the type of space travel capability we look forward to. Exopolitics 2007 Hawaii and X-Conference 2008 Slideshow by Dr. Valone (19 Mb PDF). The Birth of Section-F" Gravity Wave and Antigravity conferences 12-page interview by Tim Ventura from American Antigravity website. 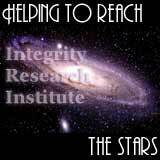 Copyright© 2008 Integrity Research Institute. All rights reserved.